Monday. A. M. Bean called this morning with his Description List, which had been made by Orderly True. His clothing account was entered as $39.05. If it is not correct it will be rectified when we get the clothing book. He with nine others of the Regt. has re-enlisted for 2 years, their time to commence from the date of muster out of the 22nd. They are to have two months furlough from the 15th of July. Tuesday. Received a letter from Pamelia dated June 15th. All well at home. Bless the Lord, O my soul, & all that is within me, bless his holy name. She had received the two letters written at Algiers, 7 knew that we were here before Port Hudson. Went out to the 3rd Brigade Commissary, to draw rations for the 3rd, 4th, & 5th [illeg. word] Only a part of the articles we wanted were on hand, so we waited for teams to come from the landing, & at length, got nearly all except rice & beans. Issued the rations in the afternoon. Some new recruits came in toward night, whom we shall have to draw for tomorrow. Tuesday. This morning Sergt. North brought in the muster & pay rolls, having filled up to of them yesterday. I completed … one for him, & he took the whole back to the Regt. to finish. Lt. Truworthy who started on Sunday for Baton Rouge for the last rolls had not returned this morning, & we fear something has befallen him on the way. 10 o’clock. The “storming party” has just got into line to be reviewed by Genl. Banks. I do not go out, as I cannot obtain a horse this morning. The commissary has brought in the balance of the three days rations, & has issued them to the companies, & all appear to be well satisfied with their share. In afternoon[!] wrote a letter to Pamelia stating how I am situated, & what the “storming party” hope & expect[!] to do. 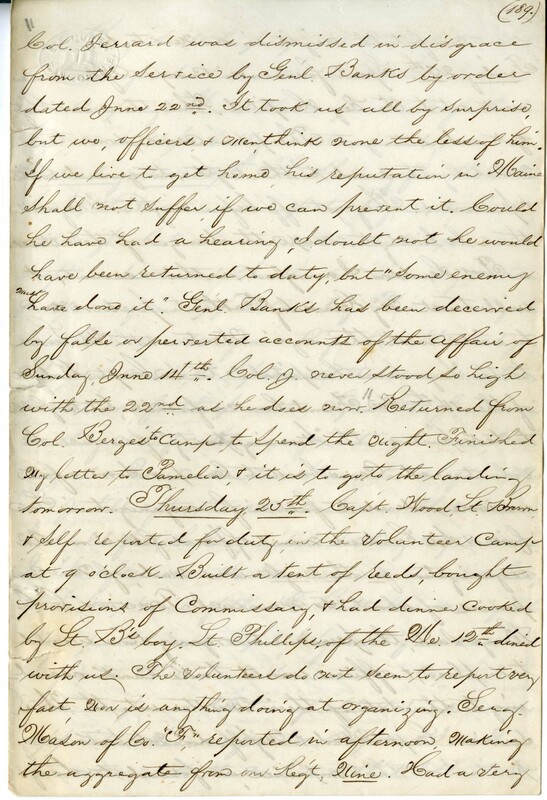 Carried the letter, with sever other home letters, to Lt. Jerrard, who will forward it if I do not survive this attack. Also gave him the certificates I made on the 28th about ordnance, ord. stores, & Quartermaster’s property that I am responsible for, so that if I am not alive to settle my co. business, he may be able to do it without loss to my family. I trust that a kind Providence will spare me to do this business myself, but think it wise to entrust it to someone who will feel interested to have it done correctly. Lt. Brown went on to the Regt., says it was mustered for payment. Capt. Wood has gone over this evening. At dress parade the Capts. Were directed to see that the companies get through with breakfast by 6 o’clock tomorrow. Monday. Went early to Col. Berges’ quarters, for the morning whiskey ration for the men, but the Col. said there was but little left, & I need not issue any today. The men were much disappointed. Spent all the forenoon in getting three days rations from the Brigade (3rd) Commissary. The three days extend to Thursday night. Met Genl. Banks while going out to the commissary. He is to review the “storming party” at 4 ½ P.M. At that hour both Battallions came out under their commanders, & formed in line, but after waiting till after 6 o’clock it was announced that Genl. Banks was unwell & not able to review them, but that if able he would review us at 10 tomorrow. Thursday. Capt. Wood, Lt. Brown & self reported for duty in the volunteer camp at 9 o’clock. 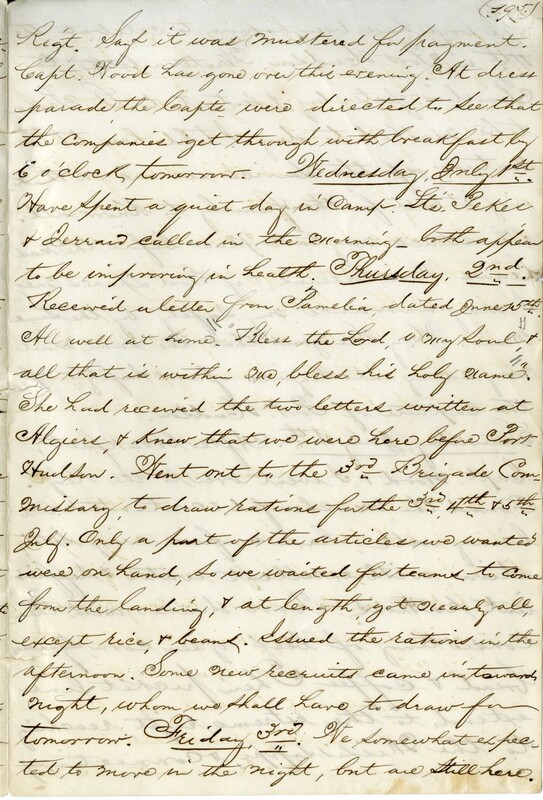 Built a tent of reeds, bought provisions of commissary, & had dinner cooked by Lt. B’s boy. Lt. Phillips of the Me. 12th dined with us. The volunteers do not seem to report very fast, nor is anything doing at organizing. Serg. Mason of Co. “F” reported in [the] afternoon, making the aggregate from our Reg’t. nine. Had a very quiet comfortable night in our new tent. Sunday. Turned out about 1 o’clock A.M. & got into line. 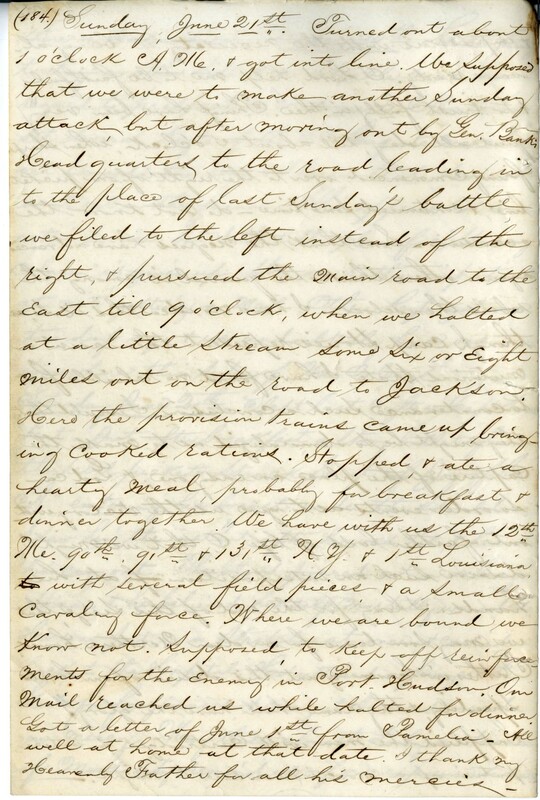 We supposed that we were to make another Sunday attack but after moving out by Gen. Banks; Headquarters to the road leading into the place of last Sunday’s battle we filed to the left instead of the right, & pursued the main road to the east till 9 o’clock, when we halted at a little stream some six or eight miles out on the road to Jackson. Here the provision trains came up bringing cooked rations. Stopped & ate a hearty meal, probably for breakfast & dinner together. We have with us the 12th Me., 90th, 91st, & 131st N.Y. & 1st Louisiana with several field pieces & a small cavalry force. Where we are bound we know not. Supposed to keep off reinforcements for the enemy in Port Hudson. Thursday. I omitted to record above that a flag of truce was sent in yesterday, asking leave to bring off the dead & wounded that were left in the field Sunday. The Ambulance Corps was engaged in it all the afternoon. The number brought out is set by them at from 120 to 240. None of them appear to have counted them—only two were found alive. The rebs. came out & assisted in collecting the bodies. God grant that we may not be called into another Sabbath fight. When will our Generals learn to observe God’s day? 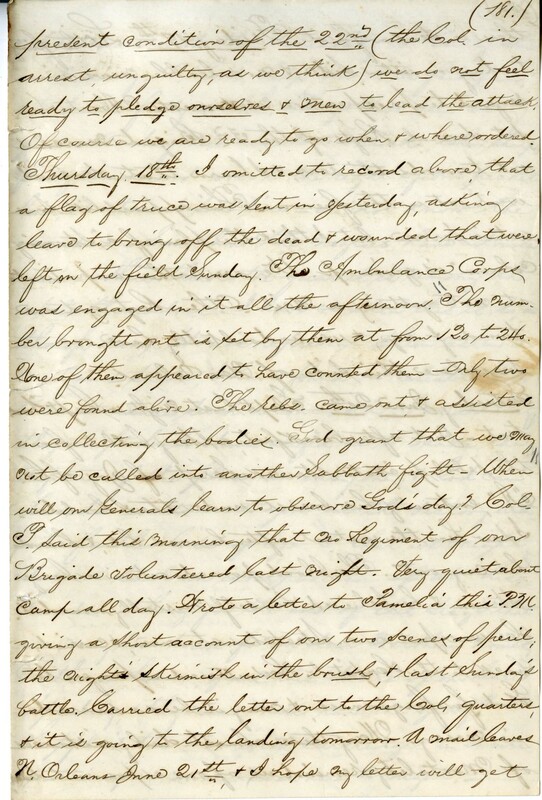 Col. P. said this morning that no regiment of our Brigade volunteered last night. Very quiet about camp all day. 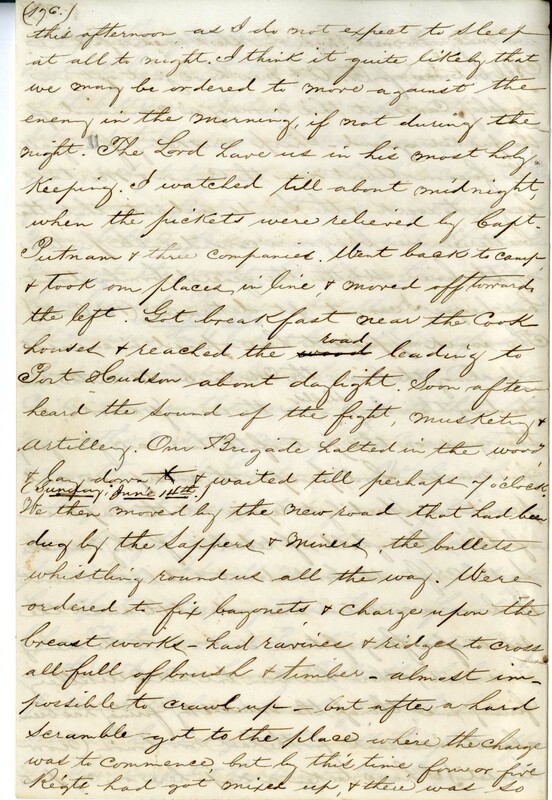 Wrote a letter to Pamelia this P.M. giving a short account of our two scenes of peril, the night’s skirmish in the brush, & last Sunday’s battle. 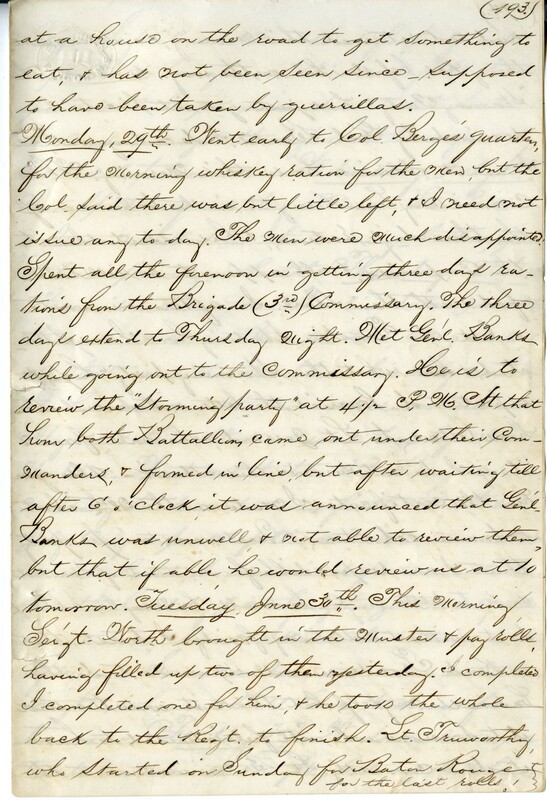 Carried the letter out to the Col.’s quarters & it is going to the landing tomorrow. A mail leaves N. Orleans June 21st, & I hope my letters will get there in season for it. Monday. Thus was passed the most terrible Sabbath of my life. The dead & wounded lay everywhere, & the stretchers were carrying them all day. I can form no estimate of the loss, but it must have been very large, several hundred. Sergeant Allen of Co. “E” was instantly killed on the charge, & several in other companies wounded, but God in mercy spared all my company, for which I desire to render him the highest gratitude of which my heart is capable. We can account for every man except F. Holbrook, who has not yet come in, but I think he is safe, as he fell out before we reached the most dangerous spot. Have not paper to record a tenth part of the incidents of the day, but they will live in my memory while I live. God forbid that we should be called to such another day’s experience. I think by this time that the hope of carrying the place by a charge is abandoned—at any rate till more suitable place for it can be found. Our Reg’t. behaved well through the day, & Col. Jerrard was as fearless as a man could be, exposing himself continually—no man could have done better. No officer of the Reg’t. faltered for a moment, or or[!] showed the least disposition to shirk his duty. Holbrook reached camp about noon unharmed. 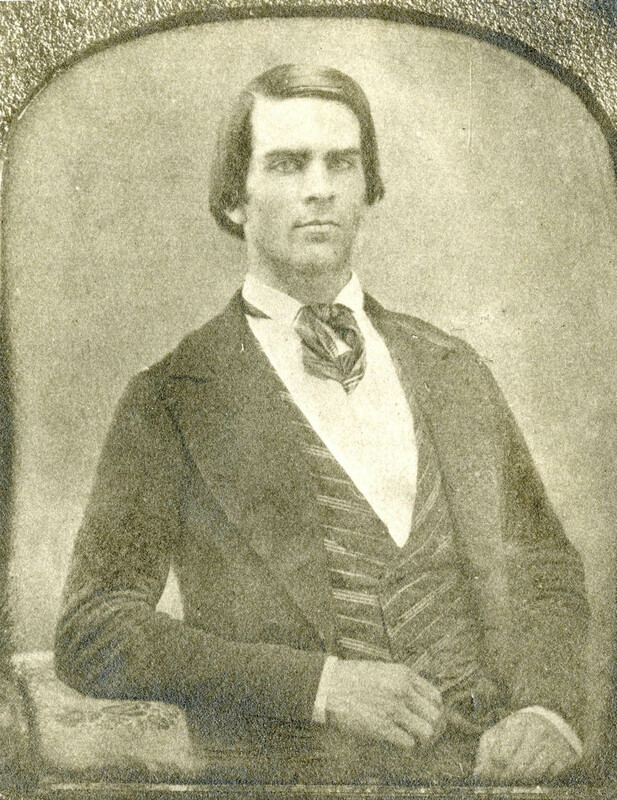 Haskell has been sent to Baton Rouge with other wounded. He is not very badly hurt, I think. 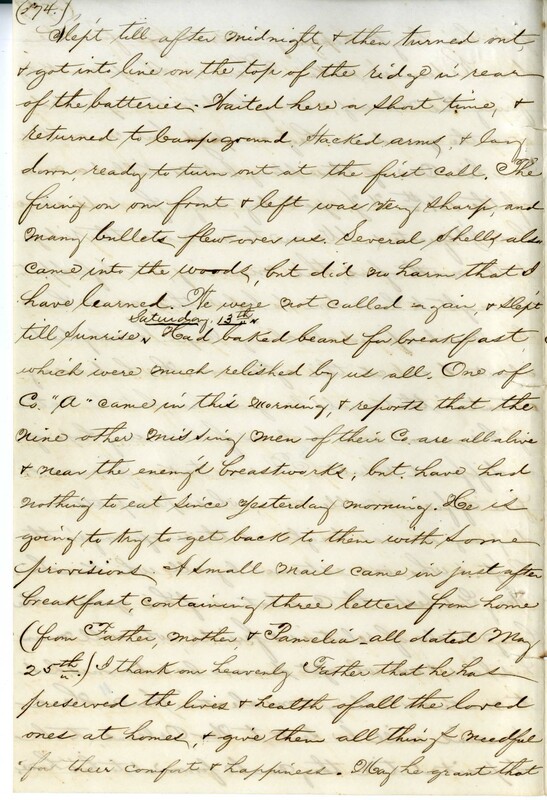 Col. J. was notified this P.M. that he is “under arrest”—supposed to be for disobeying an order to charge over the breastworks yesterday P.M. Had he made the charge at the time & place, & led it himself, (as he certainly would) I presume every man of us would at this time have been either dead or a prisoner. Old[!] Regiments had tried it in the morning, & failed, & every one of our Reg’t. officers & men feels that the Col. was right, and not one doubts his courage. The officers held a meeting, & chose a committee of three (Capts. Case, Bolton & Gilman) to assure Col. J. of the approval of his officers of his course yesterday, & that they will sustain him. Sunday. We then moved by the new road that had been dug by the sappers & miners, the bullets whistling round us all the way. Were ordered to fix bayonets & charge upon the breastworks—had ravines & ridges to cross all full of brush & timber—almost impossible to crawl up—but after a hard scramble got to the place where the charge was to commence, but by this time four or five Reg’ts. Had got mixed up, & there was so much confusion that it was impossible to form a line (the 22nd was less confused than the other Reg’ts.). Moved farther to the left to get more out of the way of the sharp-shooters, & got as good a cover as we could. Here we lay till the middle of the afternoon, the sun beating down terribly, & the bullets constantly whistling over & among us. While lying here, Corp. A. Haskell was struck in the breast by a bullet, making a flesh would. Sent him out to the Hospital. (Boker had been hit previously by a buckshot.). Ivis, Allen also had a slight wound made in a toe. These were all of Company “H” that were struck, though several escaped as by a miracle. In [the] middle of [the] P.M. companies “h” & “E” took position in ravines where they were better sheltered, & we lay till about 9 o’clock, when we were ordered back to camp. The Reg’t. formed out near the bridge on the main road, & moved into camp. Lay down, & slept soundly till morning.